Current regulations allow financial advisors to sell products like mutual funds and give the appearance that they are giving you financial advice that fits your situation. The problem is embedded advisors, like those at your friendly neighbourhood bank, are paid on a commission matrix that rewards sales. That means you don’t really know if you are paying for the product or for good advice. So when should you pay a professional for investment advice who isn’t going to try and sell you a product? Our guest today, Sandi Martin, an advice only Certified Financial Planner with Spring Financial Planning, calls this being ‘solution agnostic’. With Sandi’s help, we outline when you can benefit from hiring a financial planner. A fee-only financial planner gets paid based on time. They charge to give you financial advice about meeting your financial goals; they don’t sell products or advise on what stocks to buy. A financial plan is a comprehensive look at your current and future financial state. Having a third party help you wade through the massive amount of information and options available to you can provide some added objectivity and help prioritize what’s important. Whether you need to pay for outside advice depends on your life situation. You have a young family – It can be overwhelming to think of what you’ll have to be prepared for in terms of spending when you have a young family. A financial planner can advise you on what you’ll need, whether it’s life insurance to a post-secondary education fund, and help ensure that you’re staying on target with your money goals. Sandi calls this ‘life cycle smoothing’. The idea is to identify what you need to be doing financially rather than what you think you should be doing. You’re in debt – Debt repayment should be a priority. Before you can begin to invest in an RRSP or TFSA you need to improve your cash flow, and that means eliminating debt. A financial planner can help you look at your cash flow to build a debt repayment plan or may refer you elsewhere if you need more formal debt restructuring. You’ve recently become debt-free – If you’ve recently paid off your debts or completed your bankruptcy or proposal and are now looking to create a more stable financial future with savings targets, a financial planner can help you assess how you got into debt and how to make sure you can avoid falling into the debt trap again. Since you now have a blank slate, they can help you set new financial goals and priorities in addition to changing old habits. Should you pay for investor education? If you’re investing you can get a managed and diversified low-cost portfolio from Vanguard at a fee rate of .1% per year on your balance. Compare this to the average mutual fund in Canada with fees of 2% or more. What you need to ask is what are you getting for these fees? Those fees may be answering some key investment questions – what stocks to buy, how to balance or re-balance the portfolio. However, there is a difference between investment advice (what product to buy) and financial planning and someone selling products can’t necessarily deliver both. While a financial planner doesn’t tell you what stocks to buy, they can help you set investment priorities. They might recommend which to do first; pay down your mortgage or save, how much you should be saving to meet your goals, or whether you should be saving in a TFSA, RRSP or RESP. if I’m going to do a financial plan for a client I have to tell them here’s what I’m going to do for you, here’s what success looks like because we have to work out with the client what success will look like at the end of an engagement and here’s how much it’s going to cost you because it’s going to take me this long to do it. For a more detailed look at what a financial planner does and when you should and shouldn’t use one, tune in to the podcast with our guest Sandi Martin from Spring Financial Planning. 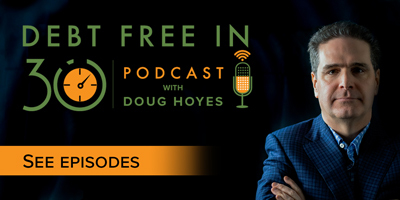 Doug Hoyes: Today on Debt Free in 30 we’ve got a lot to discuss. My guest today is a certified financial planner and on her website she says she likes working with clients who have more goals than money. She has a particular interest in helping young families make a financial plan so we’ll talk about that and lots more on today’s show. So let’s get started, who are you and what do you do? Sandi Martin: I’m Sandi Martin and I’m an advice only financial planner. Doug Hoyes: Advice only, I think that might come up later on. So, let’s start with some history, tell me about your life as a banker and then what lead you to start what’s now called Spring Financial Planning? Sandi Martin: Right, I was a banker for about nine years and within the first year I realized I probably shouldn’t be a banker because it’s difficult to do a really good job for your bank manager and your clients at the same time and I like doing a good job and that gives me angst. So I had a really good bank manager in my early years when I was in Huntsville, her names was [Shelly Crosure,] that doesn’t mean anything necessarily, nobody knows her, but she gave me a copy of The Wealthy Barber Returns and it just blew my mind because it was totally different from what happened in banking. And so then I formulated a plan to escape banking as rapidly as possible and I move slow so it took me three or four years. Doug Hoyes: Wow and so you – and that’s how you started – it wasn’t called Spring Financial Planning at the start. Sandi Martin: No it was called Spring Personal Finance at the start. Doug Hoyes: So it’s’ been – it’s a totally new name, new brand, new everything. Sandi Martin: Totally, night and day. Doug Hoyes: And what was the big problem with the bank then? You said you were there for 10 years and after the first year you figured out, ugh, and then it gradually took awhile to find the exit. So what was it that did not make you happy there? Sandi Martin: Well, the end goal to be a successful bank employee is to sell as many profitable bank products as possible without running afoul of the regulator or the compliance officer. And so the sales team meetings were all about, all the wording, all the training, was about doing the right thing for the client but on the other side but also the thing that gets them into equitable mutual funds or the thing that gets them a secured line of credit. Doug Hoyes: So you’re saying bankers are sales people, is that you’re saying here? Sandi Martin: I am telling you that. Doug Hoyes: I can’t believe that. Sandi Martin: I am a terrible salesperson so now the cat’s out of the bag. Doug Hoyes: So that was really the problem that – so if I understand it correctly, you get some kind of, you know, checkmark on the personnel records or you get a bonus or something if you put someone into a mutual fund, but if you show them a way to pay off their mortgage a year faster, there’s no pat on the back for that. Sandi Martin: That’s exactly right, there’s a compensation matrix. So I was paid – I mean everybody does it a little bit differently, but where I was paid a salary and then I had my performance review, some of it there was some soft things that were all supposed to be around what I said before, what’s best for the client. But all of the quantitative measures were how many dollars in mortgages did you sell, how much used line of credit dollars went out the door from you, how many equity mutual funds. And it kind of there was the dollar value and then what it meant for you on your performance scorecard that was drilled into everybody’s head. But yeah, none of that sort of stuff about meeting your goals or being financially free none of that stuff was measured because it wasn’t important because what gets measured gets I don’t know what that. Doug Hoyes: Compensation matrix, I like that word though, that sounds pretty good. So let’s get back to this whole fee only thing then that you were talking about. So back on episode 198 my guest was Jason Health, who’s also a CFP, and he explained what it means to be a fee only financial planner. So, I’d like to hear your take on that. And I think you kind of already hit the point that at a bank you are compensated based on how many things you sell, obviously it’s not the same when you’re a fee only financial planner. Sandi Martin: Right, well we get paid based on the time that we spend with clients. So if I’m going to do a financial plan for a client I have to tell them here’s what I’m going to do for you, here’s what success looks like because we have to work out with the client what success will look like at the end of an engagement and here’s how much it’s going to cost you because it’s going to take me this long to do. That’s it. Doug Hoyes: So if I come to you and you’re going to be my financial planner and, you know, here’s all the things that need done and you say okay, it’s going to cost X amount of dollars for the next six months or whatever, that’s what I pay you. And it doesn’t matter if at the end of the day I decide to put my money in mutual funds or pay down debt or buy stocks directly or whatever, you get paid the same amount regardless. Sandi Martin: Yeah, it’s solution agnostic is how I like to call it. Doug Hoyes: Solution agnostic, okay. So compensation matrix, solution agnostic, I guess we’ve got the title for this episode, that’s going to go viral. So, okay now that’s the preamble let’s get to the good stuff here. So I want to put up on the screen, I don’t know if this is going to work or not because I don’t really know how to work all this kind of stuff. So let’s see here, this is, I don’t know if you can see that or not, but so this is a tweet that you sent out on June 22nd, 2018 and I don’t know I’m thinking you were not in a good mood when you sent this. You should never tweet when you’re in a bad mood. But what you said was so, and whenever you start off with so you know you’re not in a good mood, so, since the CSA has decided that it’s perfectly fine for financial salespeople to continue pretending like they’re giving you good advice for you, instead of for how much they’ll make off you, here are a few people to get to know if you need advice. And then you I think listed like 14 people, you know, there’s this guy and that guy and this person and that person and, you know, who are all perfectly good, fee only, financial planners. And oh, look there’s Jason Heath, we just talked about him so I guess he’s in your good books as well and a bunch of people jumped on at the end of that. So first of all what is the CSA and what is this it’s perfect fine for – what are you talking about here, what got you going on this one? Sandi Martin: Well, the CSA is who regulates the investments in Canada let’s put it in really simple terms. So, I’m not sure how much the listeners know or care to know about regulation of investment advice and sales in Canada but there’s a national body and then there are provincial bodies. And in the end it’s really the provincial bodies that matter the most. So we don’t need to get too far into it but let’s talk about them as one of the regulators, one of the regulators whose opinion matters and the direction of their rules matters to what happens in mutual fund sales and all sorts of other things. What was the rest of the question, I got stuck on that one. Doug Hoyes: Okay, so there’s this regulator body called the CSA and sometime around June 22nd they must have come out with some kind of pronouncement that said you can, you know, do whatever you want. That’s kind of what I’m reading into this. Sandi Martin: Well, no. I mean to me that’s the effect, that’s the net effect of what they’ve come out with but the CSA and various other regulatory bodies in Canada have been consulting on how to make financial advice better for Canadians for a very long time. So the new – the stuff that’s coming out now – so for example this I think they decided that they were not going to, if I recall correctly because there’s been other stuff that’s happened since then, I think that particular announcement was we are not going to pursue trying to ban embedded commissions in investment products. Which is you get paid, you know, the advisor who gives you investment advice gets paid because that product that they sold you continues to pay that advisor over time, a trailing commission, right? Doug Hoyes: And so this is kind of the whole key to it then. So I go out and buy a mutual fund and it doesn’t cost me anything to buy it. I know if I go on the stock market and use my stock trading account, they’re going to charge me 10 bucks commission or whatever it is to buy the stock. But I can buy a mutual fund and it doesn’t cost me anything, it’s free. And you’re saying no, it’s not really free. Sandi Martin: Well, no and so if you’re getting good advice – so the premise is the person giving you advice about what particular mutual fund or what particular security to buy needs to be compensated for that advice because they’re a professional, totally fine, not arguing with that. It’s easier for them – the position and actually there’s a series of even angrier tweets later on. But the position of many members of the industry is if we don’t embed that kind of compensation for the professional inside the investment, if people have to pay for it directly, then a lot of small investors aren’t going to get the kind of advice, good advice that they need, because nobody will deal with them because the cost will be too high. And so the swazz of Canadians are going to be without meaningful high quality investment advice and we can’t have that so let’s make sure that these people are still paying through their mutual funds instead of any other fee arrangement, which I say is I’m not sure what words I’m allowed to use. Doug Hoyes: You can use whatever words, I’ll bleep them out later. We’re not on live TV, this is on, you know, iTunes and YouTube. So what you just said there sounds all perfectly rationale, I’m just a little guy, I don’t have a million dollars. I put a couple of hundred bucks into a mutual fund and so I don’t have thousands of dollars to pay an advisor but because I’m buying my mutual fund from that guy he’s getting a fee from a mutual fund company, sounds like a win/win for everybody. Sandi Martin: Sure, sure. If you’re not paying though directly there’s a whole host of things. So number one if you’re not paying directly for all the different things your advisor’s supposed to do for you how do you know which ones you’re paying for and whether you’re getting them or not. Doug Hoyes: Lack of transparency here. Sandi Martin: The second thing is if you are paying your advisor via the ultimate product that is meant to be the solution for the problem you came in with – nobody goes in and says I would like to buy a mutual fund. They go in saying I don’t know if I’m going to be able to pay for my kid’s education or am I saving enough for retirement or I just got a lump sum offer from my pension, should I keep it or should I take it out and invest it or should I just keep it inside my pension? The solution to all of those is not necessarily a product but if the person to whom you go for advice has only products to compensate them, then the solution is always going to be a product because otherwise they’re doing pre-work. Doug Hoyes: Yeah, so if all I have is a hammer then everything looks like a nail. So, all I can do is sell mutual funds and that’s what I’m going to put you in, I’m never going to put you in anything other than that. Well not necessarily but that’s the risk, that’s the bias, you don’t understand – I think the biggest problem is that people don’t understand that’s how my person gets paid. Sandi Martin: Well and I think the other thing that people don’t understand – so you’ve all seen on the internet like the varying expanded mind memes. So the first thing is oh my goodness, this person is only paid when they give me a product. The second level is yeah, but where can I get the kind of advice that they are giving me if I’m not paying them the way that they are able to be paid because I can’t tell somebody this is what form of the industry that’s needed. Because I used to be able to sell mutual funds, I have the same or better qualifications as the person who today could tell you what mutual funds to buy. But I’m not licensed to do so for lots of different reasons, many of them because I just don’t want to be. But I can’t on an hourly or a project basis directly be compensated for my clients and give them investment advice, I can’t tell them what to buy I mean if the solution ends up being kind of investment product. And so we have these captive advisors who can only sell what’s on the shelf behind them at what particular bank they’re at or the mutual fund company that they’re at and we have these captive clients who can only get investment advice at their level from people who are with these captive advisors then that’s where the regulations need to step in and fix it because we need to end that. Doug Hoyes: And so, I’ve just given you this magic wand here and you can fix everything. You’ve only got a minute though to use it because I don’t want you to have unlimited power forever. So what is – what is the one thing you would do right away then to help fix this? Sandi Martin: I would create a class of advice that’s allowable under the regulations, that is checked by a compliance office the same standard of client care, better standard of client care. But the same standard of regulatory oversight for a group of fee for service investment advisors who can then say I am now regulated. I’ve got somebody watching me, all you need is the vanguard all in one fund or no, that’s too simple for you, you need this other thing instead, where they don’t have to manage the client’s money, they don’t have to worry about oh, you have less than $5,000 so I can’t handle you. It would be a new class of regulated advice. Doug Hoyes: So you are a CFP, right? 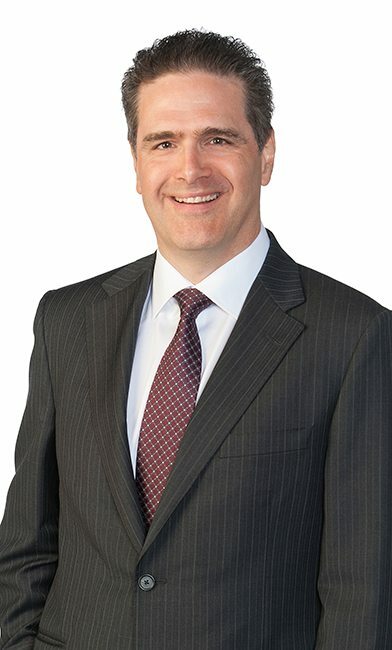 Doug Hoyes: Which means certified financial planner and I realize that in many provinces you can call yourself a financial planner and it’s not even a thing but in your case you actually took some courses and wrote some exams and actually know some stuff, we hope. So why do you need to be regulated then when you’re already covered by this governing body? Sandi Martin: Oh my goodness, well this governing body, just the same with the regulatory bodies, there is not a every single trade, every single piece of advice standard of compliance. So, it’s not like well if they tell me something wrong somebody’s going to catch it, that’s not how it works, number one. Number two, there is no meaningful standard of advice delivery, there is no – if you get your CFP you can deliver financial planning advice however you want to. You can call it a comprehensive plan and not include anything about their insurance coverage for example. You can do whatever you want. So it does need to be regulated to some degree because the people who are coming to us, we’ll talk about this later I’m sure, are the people who have decided I need somebody outside of myself to give me advice about what to do with my money. Those people if they knew what that standard of advice should be, might not need to come to an advisor to get it. Doug Hoyes: Well, so let’s talk about that right now then. So why does someone need a financial planner, why can’t they just do this themselves, why can’t they do their own research, you know, make their own spreadsheets, whatever. What is the point of paying – and let’s assume it’s a fee only financial planner we’re talking about, it’s not somebody where fees are, you know, buried somewhere. You know right up front what you’re getting, what you’re paying for. Why would someone need a financial planner? Sandi Martin: Not everybody does. Actually I’m sure most people who are really intelligent – all of our clients are super smart, engaged people. So it’s not because they don’t get it and it’s certainly because the information isn’t out there. If you look hard enough, and sometimes you don’t have to look very hard at all, you can find the answer to most of the questions. Now that being said, nobody has perfect objectivity about their own situation. So I know what I want out of life, I know what I want to feel like but whether that means that my US citizen husband really should then use a TFSA or not but oh. Well maybe in this case. Okay let’s go back one step. All these lovely, well written out, researched blog posts about financial independence or and whether the 4% rule actually applies or any of those things, every single one of them the very first thing that somebody does is after they read it is go what about me, because everybody has some unique thing about them. So again, people can find that stuff out, that’s not hard. And I definitely don’t want to say everybody needs a financial plan because a lot of people – there’s very few people who absent a financial plan are going to fail miserably. Most people muddle their way through their lives without too much help from outside people. But if you do wonder like I have 15 different things I could pay attention to, what are the most important ones or is it really important to pay attention to this one thing because I’m zooming in on how much I pay for groceries and maybe I need to be thinking about my house purchase or something, I don’t know what the examples are. But having an objective third party that understands what your rules for success are and can apply all those technical bits of information like the way estates work or what a trust is going to do or what kind of insurance you actually need, that’s helpful it’s helpful to have that third party. Doug Hoyes: And I guess that’s true of pretty much area of life. Well, I can probably figure out how to do nutrition on my own, I can probably figure out how to, you know, fix my car on my own but having an expert help me through it certainly shortens the learning curve I would think right off the bat. Sandi Martin: Well nutrition and exercise are certainly a really good example of a place where we know what the thing to do is but sometimes it’s just helpful to have somebody that you’ve promised to do it to, to be accountable too. Doug Hoyes: So you’re the person on their shoulder telling them okay, let’s keep an eye on this. So, okay so I’d like to talk about a couple of scenarios because of course this is Debt Free in 30 so we’ve got to talk about debt here at some point. So, if someone was to come to you and, you know, you go through their numbers, help them start working on a financial plan, and that person has debt. Okay and I’m going to make it that generic a question because obviously I understand the difference between someone has $50,000 in credit card debt and $50,000 mortgage on a million dollar home, those are two completely different things. But let’s keep it totally generic, so someone comes to you and you see that they’ve got debt and let’s just assume that in your mind that’s kind of at the top of the list, whether it’s in their mind or not. But okay that’s a problem. What kind of advice are you going to give someone like that? Sandi Martin: For the most part if somebody has debt and we, in my mind or in kind of a team that springs to mind, that needs to be number one, given what this person is saying about what is success for them, this debt has – it’s a priority. Most of the time we tell them that they either need to speak to our cash flow specialist before they can do any planning, it doesn’t make sense to waste money on whether you should invest in an RRSP or TFSA or not if you’ve got this debt that’s a priority. But if the debt is – the debt is a priority, we want them to talk to cash flow because cash flow is all about debt repayment and making sure that you’re not filling in the debt hole and digging a new one on the other side with your habits and your lifestyle, right? You know that perfectly well. Doug Hoyes: Yeah, you’ve got to stop the bleeding first. Sandi Martin: Right? But if it’s bad enough that we – because of course professional advice comes at a fee and so it’s not to say well go off and fix your debt and then come back because it’s rarely that simple. But it’s hard to have a conversation about why they should work with us if the bleeding is so heavy that it doesn’t really matter what the plan is, they just have to deal with that first. So very frequently we’ll send somebody again either to cash flow or to debt restructuring of some kind. Doug Hoyes: And deal with that problem and obviously every situation is different, it could be that I was off work for a period of time and now I’m back to work so the thing that caused my debt isn’t that big an issue. But you’re going to get to the underlying issues then. Well, let’s take the other end of it then. So, let’s say that somebody has – had a whole bunch of debt in the past, they’ve gone through a bankruptcy or proposal, they’ve now dealt with all their debt or maybe it’s as simple as they’ve, you know, paid it off themselves. They’re now coming out the other end. So they’re kind of starting from scratch. They’re perhaps older, they’re not 18 years old anymore and they no longer have any debt but they also don’t have any assets or anything else. They’re starting over. What kind of advice would you be giving somebody in that type of a scenario? Doug Hoyes: Don’t you have a one size fits all plan that you give to everybody and it’s all exactly the same? Sandi Martin: Oh, you’re the number three, here you go. Doug Hoyes: Yes, here you go, boom. I’m still going to charge you $5,000 for that but here you go. Sandi Martin: No, so the first thing we need to do though is assess if they really, I don’t want to say, learned a lesson is not the tone that we use, but if they’re coming out of debt and they’re a blank slate there’s a difference between somebody who is like oh, finally I can do all the things I want to do because I don’t have that payment I need to make anymore. And somebody that goes oh man, that was really tough, let’s make sure that from now on we’re doing things in a way that doesn’t ever expose us to that situation again, right? And so with the one person we’re having very long conversations about what sort of really annoying boundaries we can put between them and overspending. And with the other kind of person we are talking about okay, so you can do anything, you’ve learned that lesson. So what does this look like now? What are the things that you want to guard against, number one and number two what does your life feel like now that you don’t have that and how can I give you more of that feeling? Doug Hoyes: Yeah and that would be a pretty fun part of your job because like you say it is a totally blank slate that you’re starting with. So, I would assume another category in another blank slate area would be young families because obviously they don’t have, you know, 20, 30 years of investments built up, they also perhaps don’t have massive debt built up as well. And I mean I understand that young families are one of your, you know, favourite areas to deal with. What kind of issues do you see with young families and what kind of advice do you give them? What makes a young family different than, you know, older families or single people or whatever? Sandi Martin: Life cycle smoothing. Doug Hoyes: Life cycle smoothing. Sandi Martin: We’ll just add that to the list. Doug Hoyes: Yeah that’s another one, good. I like it, yeah. Sandi Martin: So young families are bombarded with a lot of shoulds and some of them, and of course I have to say we because I have a young family, I have three kids under the age of 10. But so we feel as though we have, this is very specifically, we have more goals than money, as a phrase comes from. We feel like we have to be saving for our own retirement, we have to be aggressively paying down any debt that we have, right? So often there’s a mortgage or whatever. We also have to be saving four our kid’s education and then we have to deal with oh, you need $5 for that run tomorrow, oh crap. Oh my goodness there’s going to be a birthday party down the road and they put on big birthday parties and now we feel like we should put on big birthday parties. There’s so many shoulds on a young family and they feel like they have the time, often they’re young people having young families and they just haven’t spent time learning about what’s most important to them and how everybody else can just buzz right off. Doug Hoyes: So that’s your job to tell them that everyone else can just buzz right off. Sandi Martin: Well and also that’s a beautiful time to help people really understand what they want out of their lives because it’s really – it feels really germane. Because when you have young kids everyone’s telling you like seize the moment, they’re only young once, those are true things but so how do you use that information to stay sane. Because oh my goodness it’s also super crazy, how do you stay sane and don’t – and pick the things that are actually of value to you and the kind of family that you want to build? You’re building something, it’s brand new. So how do you – don’t build it according to what the defaults are or what your mother says you should do, what the neighbour down the block does, you have a chance to build something that’s just for you. Doug Hoyes: Pretty exciting then. That’s why you like this job, you get to do fun stuff like that. So now there’s another category in fact looking at your website you guys have a book, Women and Money e-book that’s on your website where you talk about women need financial planning, challenges they face. And I think we’re all somewhat familiar with those things. They’ve got a longer life span, you know, more likely have more health challenges whatever, obviously taking time away for the three kids that, you know, you’ve got and daycare and all those types of things. And that’s very similar to a lot of the findings that we’ve come up with. You know, in our women and debt study, why women file bankruptcy at a higher rate, why they have different debt levels and so on. So tell me a bit about your experience with that, so how do you guide women in particular with financial advice, so whether they’re, you know, single, whether they’ve got families or whatever, how is that different than perhaps the way you would advise a male? Sandi Martin: You know, it’s interesting so there are unique planning issues with many, not all, but many, women. But as we talk about it in our team I actually don’t think that we speak to or plan with women in very different ways than we do with men. Because the goal for us at Spring is not data in, plan out, now you’re fixed, it’s there’s a lot of self reflective work. And so when we work with women, and with men, when we work with women and we talk about what success looks like for them, frequently the answer is different than we might expect if we were a different planning firm. I’m not totally sure how to state that. But given the opportunity women can design pretty amazing kinds of success that aren’t just about I want to get to the VP position of X and that’s what success in my life is going to look like. And I don’t mean at all to intimate that that’s what men think. But given the opportunity in a financial planning engagement to really reflect on what success means for them is the whole foundation of the type of planning that we do, so whether you’re a woman or a man that’s what we’re going to be talking about anyway. And then of course we’re going to bring in well if you are going to live a lot longer statistically than your partner you get a chance to develop that vision of success again. And if you don’t have a partner you get to be the boss of that success but you have to make sure that you’ve covered some bases that a lot of men who are going to maybe pass at age 86 don’t have to think about. So it’s not – I don’t think we approach them that differently, it’s just a couple of different topics tend to come up. Doug Hoyes: Yeah, so first of all I’m going to die at age 86, I’ve got to write that down. So that’s fine. Sandi Martin: Yeah, mark that on the calendar. Doug Hoyes: That’s okay my birth certificate has an expiration date as Steven Wright once said. So, it sounds like what you’re saying is what you do for men and what you do for women is exactly the same. We’ve got to look at, you know, goals, objectives and whatnot. There may be a couple of extra layers for someone who’s in a slightly different situation I guess is what you’re saying. Doug Hoyes: Okay, so final question then. Investor education, we kind of again touched on a bit of this but again I’m thinking of my clients who have finished their bankruptcy, finished their proposal, things are now going good, they want to start putting some money away and perhaps they, you know, engage the help of a financial planner, perhaps they’re trying to learn as much on their own as they can, in fact I would say do both, why not learn as much as you can and then have someone, you know, also helping you, that seems like a good way to do it. What are your thoughts then on how people should, you know, learn to be an investor and maybe let’s start with the real basic one, which was fees, which is where we started this conversation. So how can I decide if what I’m paying in fees either to a financial planner or any other kind of investment professional? How do I know it’s a reasonable range, what’s a starting point to even think about that? Sandi Martin: Here’s a really great starting point. You can get a regularly rebalanced geographically diversified portfolio from vanguard for less than .1% that is going to do very well for almost – let’s just – for lots of people. So let’s just say that’s the baseline. So .1% you can have all the securities picked out for you, everything’s picked out for you, it’s going to rebalance on its own. Doug Hoyes: And that’s .1% of however much is invested. Sandi Martin: Of however much is invested. Sandi Martin: And it’s calculated sometimes daily and charged monthly sometimes but as a good sort of rule of thumb just say .1% per year on your balance. Doug Hoyes: Which sounds like a very low number, I mean I know I’m a chartered accountant and everything and I’m not that good at math but if I do $100,000 times .001 I guess because it’s one tenth of 1% you said. So, I don’t know that’s either 10 bucks or 100 bucks I think I probably did the math wrong, it’s a very low number. Doug Hoyes: Okay, so that’s the starting point. Okay, how do I continue thinking about that then? Sandi Martin: Okay, so then what kinds of questions would you have aside from what should I invest in, what kinds of questions do people have for the person giving them – now we’re running the danger of conflating investment advice and financial planning advice because they’re two very different things even if only one person delivers them to you. But so if you – so investor education let’s just say what kinds of questions does a normal person have about their investments? And then you can tick off where do I invest, how do I invest, how often do I rebalance any of those things because it’s done for you in this fund. So what is worth paying more than that? And so remember, you know, the average mutual fund in Canada costs upwards of 2%, most of them are around 2.4% let’s say. So for 2.3% on your $100,000 every year what do you need to get to feel like that’s worth paying? Doug Hoyes: There’s a big difference between 2.4% and .1%. Sandi Martin: Pretty big and this is relatively recent. I mean four years ago back in the fall of 2014 when the first few robo advisors came out in Canada and they were charging, you know, the portfolios cost .2% and then their fee on top of that might be .5%, somewhere in that range, so less than 1%. That was groundbreaking, four years ago it was groundbreaking. And now we’re at a point where vanguard has all in one funds that again if you have – you’ve totally filled up your RRSP room, you’ve filled up your TFSA room and now you’ve got a nonregistered account, you know, one all in one fund actually could probably do quite a good job for you anyway but you might be into okay well what do I hold and what account kinds of questions? Then an advisor might be worthwhile there or somebody more than that. But we’re kind of getting away from what investor education really is, but in terms of how much you pay and what you’re paying for, that’s again 2.3% difference between the rock bottom price and the average price that’s not even the highest price. That’s a pretty big difference that could make – that could make a compounding difference of thousands and thousands and thousands of dollars over a lifetime of investing even if you didn’t have any of the other things right, if you put it in a TFSA instead of an RRSP. You know what I mean? If you made a whole bunch of other wrong choices but you saved yourself compounding thousands of dollars in your investments. Those choices would be a little bit less wrong. Doug Hoyes: Oh yeah, it’s a massive number. I mean 1% of 100,000 is a thousand. So, one tenth of 1% is 100. Sandi Martin: There we go, now we’re getting to the math. Doug Hoyes: There we go, we’ll edit it out and it’ll all sound great when it goes to air. So there’s a huge difference between $100 and $2,400. And I’m assuming you’ve got $100,000 portfolio but more or less obviously it’s different. So, at a very basic level that’s certainly something to look at. And then I guess take that money and it might not be a bad idea with someone helping you then with everything else, it’s not just which stocks do I buy. As you say there are low cost ETFs that can pretty much do that for you. What you do is a lot more than that, it’s, you know, testing assumptions, it’s education, it’s, you know, cash flow planning, changing behaviour, all those kinds of things. So, at what point, and I ask this question to Jason Health as well when he was on, at what point then should someone let’s say they’ve finished their debt repayment plan, they’ve done their bankruptcy, done their proposal, paid it off on their own, they’re now ready to start with a financial – they’d like to talk to a financial planner. At what point should they do that? Do they need to have a certain number of dollars in the bank; do they need to have a certain number of dollars to invest in that process? At what point should they make the call to someone like you? Sandi Martin: I mean I want to say as early as possible. When you know that you are actually going to follow the advice, so that’s number one. Because I worry that there are people who come to financial planning as a magic wand exercise, like if I just know the answer to these three questions about RRSP versus TFSA or whatever, then I’m going to – I have a financial plan, I can tick that box and I can move n. And that’s not to me, I know not to Jason what the exercise is for. So if you’ve done all the things, you’ve graduated, right, so now you’re in postsecondary financial world, you’ve paid off your financial debt and stuff and you want to know how to build the scaffolding around the kind of life that you want, it means you know what kind of life you want. Maybe not down to all the specifics but you need to know what the point of it all is or in my opinion a financial plan isn’t as useful as it could be if it’s just how do I make the most money out of life? Well, I don’t know. I don’t know how you can make the most money, sorry. Doug Hoyes: You don’t? Okay. That was my last question, how do I make the most money out of life. And can you give us the lottery numbers? That would be awesome too. Because I believe you’re a big fan of buying lottery tickets, I think that’s the foundation of all financial plans. Okay, so what you’re saying again I think applies to all other professionals, the sooner you reach out for help the better. And presumably if someone listening reaches out to you, you may say well, you know what, there’s a few things you’ve got to do first, you know, come back later. But at least they can have a preliminary discussion with you or I don’t know how you do it as a – I mean you do most of your stuff exactly the way we’re talking today, which is over the fancy inter web here. That’s the first step, reach out and then you guys can figure out a plan from there? Sandi Martin: Yeah. I mean the beautiful thing is we don’t want to work with someone who is either not ready to work with us or who isn’t a good fit. And I think that’s a good bar to set. And so – and the other beautiful thing is I love talking to people about money so it’s not, you know, nobody’s obligated. It’s not like we’re going to send out a hey you spoke to a financial planner a month ago and are you ready to act now? It’s never that. So having a conversation with somebody who’s willing to listen and has some relevant background expertise can really help define for you if you are ready for that. I have no problem doing that. That’s what I have – we put all our clients through that, those paces, right? We take lots of notes, we write a long proposal letter to them that tells them what they told us and what we think we’re supposed to be doing with them. And in some cases we say it’s not the right time or no, we’re not the right people, here’s a couple of people that you should speak to instead. So the right fit matters. Doug Hoyes: And so you deal with people from all over the place. Doug Hoyes: Geography isn’t a barrier then. So, okay so how do people find you, give us websites, twitter handles, you know, your social insurance number, whatever you want to reveal here. Sandi Martin: You’ll find us by not looking for Spring Financial, which is a lending company, don’t look for them. And don’t call us if they mess up your loan because apparently, they stink pretty much and we get a lot of those calls. Doug Hoyes: We’re getting sued so send your emails to Sandi Martin if you don’t like whatever those other guys are. Sandi Martin: No, so you can find us at springplans.ca that’s where kind of everything is centralized. I spend a fair amount of time on Twitter so that’s sandimartinspf. Let me think. Doug Hoyes: Yes it is and we’ve already played the clips there, so people will be jumping all over that. Sandi Martin: Now we’ve teased that one. Doug Hoyes: Exactly. sandimartinspf, so that’s how they can find you there. And you already mentioned twitter then so those are the best places to get you. And you’ve got a – whether it’s a – explain to me what it is, a podcast, a thing where you can go online and see you talking with other people, how can we find that? Sandi Martin: So that’s at becausemoney.ca. Sandi Martin: We’re just starting season five. Doug Hoyes: Well and this is season five of Debt Free in 30 too. Doug Hoyes: So there’s a lot of laughing I saw on the episodes. You guys seem to have a good time when you do that. Sandi Martin: It’s super fun and we actually have moved. We’re only going audio for season five. Doug Hoyes: Oh my goodness. Sandi Martin: I know but there’s still going to be a lot of laughing, I mean I laugh quite loudly so I don’t think anyone’s going to – you can’t miss it, that’s for sure. Doug Hoyes: Yeah and no one’s offended by laughter so that’s excellent. So are there any final words of advice then you want to leave people with? I think we’ve covered a lot of ground there but is it as simple as reach out what you’re thinking? What are your final words of wisdom? Sandi Martin: Develop your reflective IQ, really think about what’s happening inside and what’s important to you. And then reaching out – professionals is great but the first person you have to have to really understand is yourself. Doug Hoyes: Wow, that’s pretty hard. Sandi Martin: It’s super hard. Oh my word, it sounds so easy doesn’t it? Oh yeah, develop your reflective IQ. Man spending time able-gazing, most people don’t really enjoy it but the benefits are very extreme actually. Doug Hoyes: And so if that’s what I want to do, what’s the first step now, do I lock myself in a room for a couple of hours, do I go for a walk? Like how do I jump start that reflective IQ process? Sandi Martin: That’s a really good question. I would actually say something that the Spring team’s going through now, and actually in that Twitter thread, in a forum that we have is a book called Designing your Life so it’s applying designed thinking to not just your work life or your money, it doesn’t even specifically talk about money. But it’s a set of tools to really think about the things that bring you fulfilment and the things that don’t and you just do because it’s obligation or you don’t know that you have any opportunity to make any other choices, so it’s a good book to start with. Doug Hoyes: Excellent. So there’s some practical ideas to get started. Excellent Sandi, thanks very much for being here. Sandi Martin: It’s been my sincere pleasure. Doug Hoyes: Excellent. Well that was my conversation with Sandi Martin, a financial planner and co-founder of Spring Financial Planning. Full show notes including links to Sandi’s website and a link to her big Tweet storm on June 22nd. And everything we talked about today and a full transcript of today’s show can be found at hoyes.com. 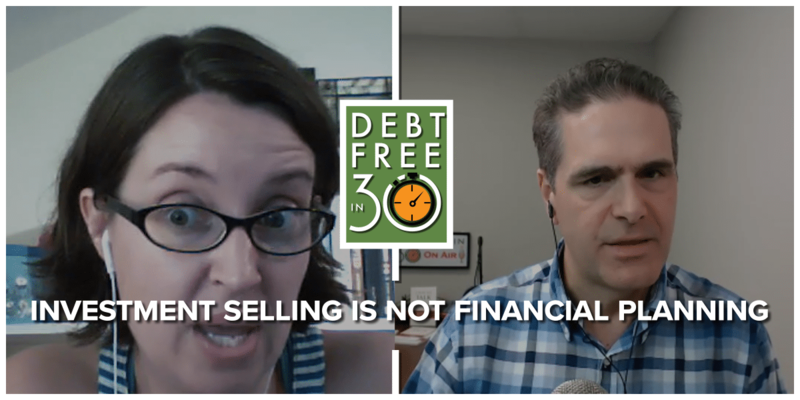 This podcast is available on iTunes and all major podcasting apps and you can watch the video on YouTube on the Debt Free in 30 channel. That’s our show for today. Thanks for listening, I’m Doug Hoyes, that was Debt Free in 30. Chatbots: Helping Your Finances or Up-selling?